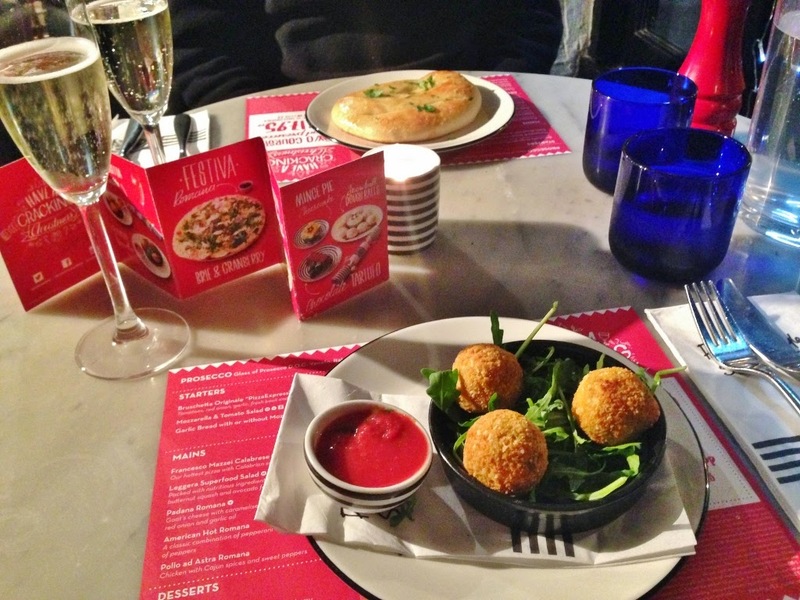 Having worked in Pizza Express's local competitor, ASK Italian in Horsham, for a considerable amount of time before my current job I've built up quite a knowledge of Italian food and the typical dishes available. With a local review on the cards, I decided to take my dad and treat him for a change. We opted for the 2 course meal with a glass of prosecco each. We ended up having a couple of glasses each, bearing in mind the extras I had to pay for - I don't mind this but for such an established food chain seeking out media coverage on blogs - I don't think 2 extras on the bill could have hurt. Oh well, that wasn't going to stop me! 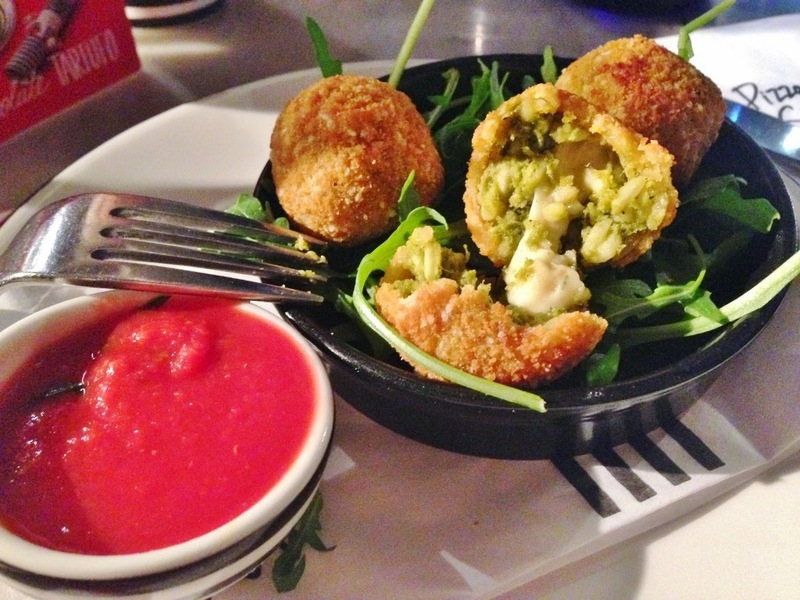 For my starter I choose the Arancini Provala, which consisted of baked risotto balls filled to the brim with spinach and provala cheese and a tasty tomato dip. 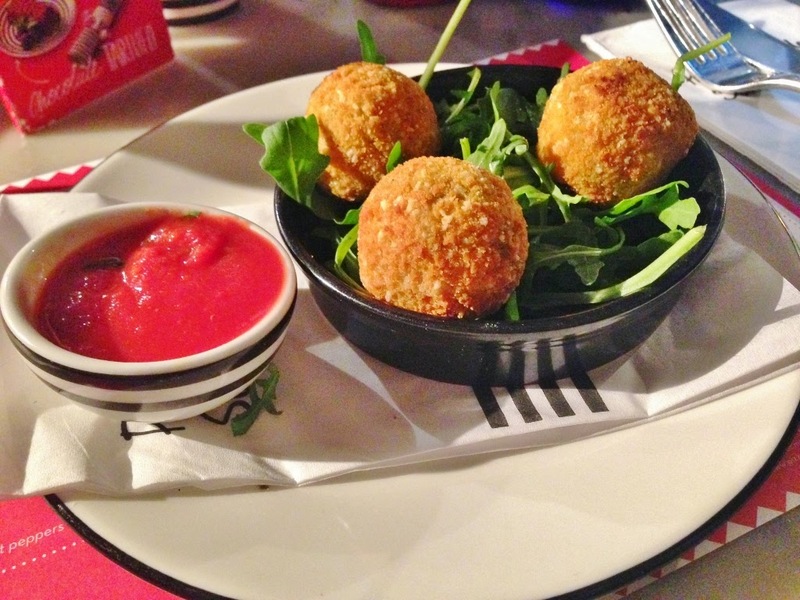 The risotto balls were baked to perfection and I couldn't fault them - then again I'd find it hard to fault a starter of arancini balls. When out for dinner I normally always opt for something baked, deep fried and filled with some sort of cheese and side dip. I pretty much will always choose this option over a dessert. 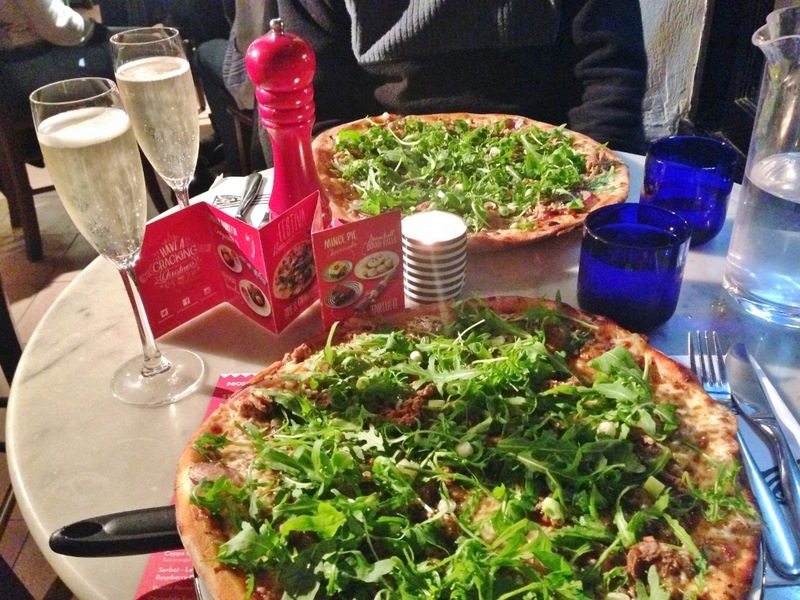 "pulled duck, shredded courgette, red onion, mozzarella on a light plum hoisin sauce base finished with rocket and fresh spring onion"
If you've visited Pizza Express before you'll know that the Romana bases are bigger, thinner and crisper. Oh my - it was definitely bigger. I'm a big eater, but even I struggled to clear my plate, not because it wasn't tasty enough, just because it came in such a big quantity, so I'm quite pleased I didn't choose the 3 course menu. The pulled pork was tender and plentiful, hidden underneath all the fresh rocket (as you can see from photo) and the hoisin sauce was seductively sweet (just how I like it) but not too over-powering - the balance was just right. 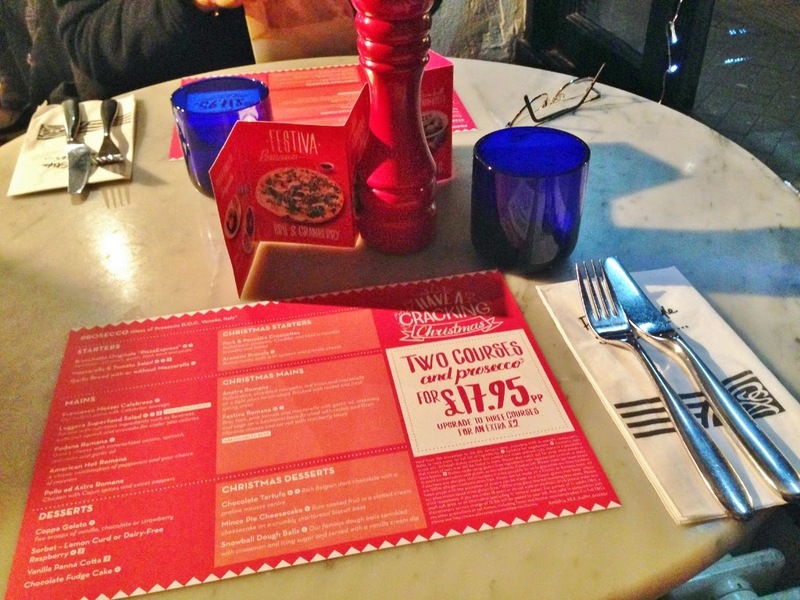 Generally, Pizza Express is my go-to place for a quick, satisfactory bite to eat. Be that as a start or end to my night, it always works and typically hits the spot. The food is good and always plentiful, staff can be quite hit and miss in any restaurant, however, I'm not one to point the finger, I've been there myself, waitressing just to get by with some dollar in my pocket and a free pizza at the end of the night. I always stand by the fact that catering is one of the most demanding, under-appreciated job industries - the people work bloody hard. Thanks for having me and I'm sure I'll be back soon! 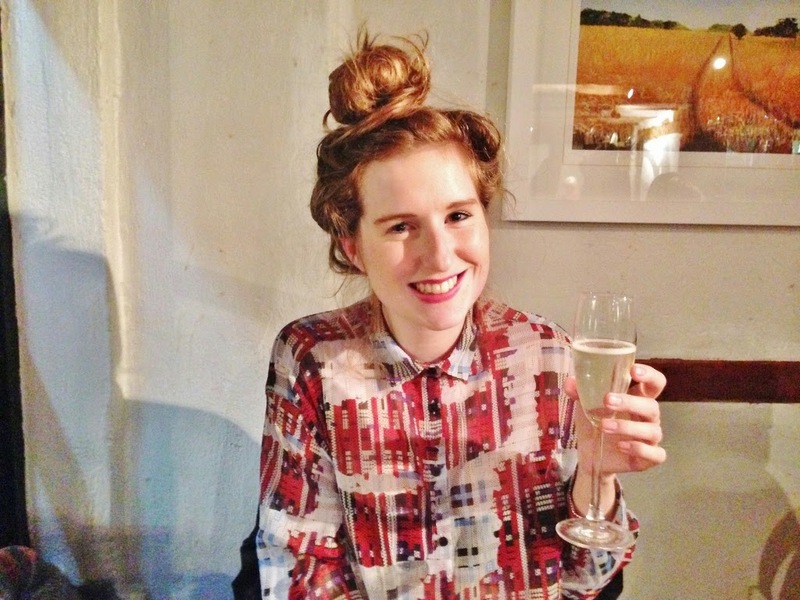 For more foodie reviews why not check out my indulgent London Sunday Roast or Cocktails and Sliders at Apres London.